The elections to the Municipal Corporation of Delhi would be held in the last week of February, preferably on February 24, if the Delhi Chief Minister, Ms Sheila Dikshit, has her way. At least 3000 Afghan nationals, who had taken refuge here in the past years due to the hostile regime and harsh political conditions, seem in no mood to return to Afghanistan in the near future even as the Taliban rule has been thrown out there. Sikh census ploy to delay DSGMC polls? A city court has directed the SHO of R. K. Puram police station to register an FIR against ACP R. S. Meena under appropriate sections of law and place the file before the Police Commissioner for necessary action. At a young age of 12, children usually think about games, kitchen sets and dolls but she is the one who thinks of music only and wants to make it her career. Bubbly and sweet-looking, this girl has a resonance in her voice and has won many prizes. She has been titled as ‘Kuchi- Kuchi Rakamma’ by the teachers of her school. She has several sobriquets. 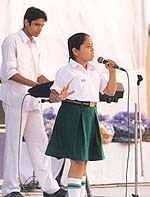 She is the ‘Nightingale’ and ‘Manav Sur Sadhika’ of Manavsthali School, New Rajindra Nagar. She is Shivangi Amrit, a resident of Hakikat Nagar, Kingsway Camp. The ongoing economic recession has cast its shadow over the New Year eve celebrations at the leading hotels, resorts and clubs here. The managements of these (picnic) spots are not organising any programme with the apprehension that the once-in-a-year event might not attract the required customers to meet the expenses. A person who was sentenced to life imprisonment and was released on parole reportedly committed suicide by consuming celphos tablets in Gola Kalan village of the district last evening. The Gurgaon police are planning to set up a team to deal exclusively with the cyber crimes. The police have already sent a number of personnel in the rank of Investigating Officers to Delhi for necessary training to cope with the increasing number of cyber-related crimes. Regular power supply has become a dream for the people of this fast-growing industrial city and elsewhere in the district. The crisis has become acute following the switching off the supply by the Uttar Haryana Bijli Vitran Nigam, not only during the day but at night also. This has been a routine for the last few days. Nearly half of the total population of this industrial town is living without the basic facility of a proper sewerage. The authorities have chalked out a plan to lay sewer lines in about 100 colonies with a budget of Rs 60 crore in the near future. 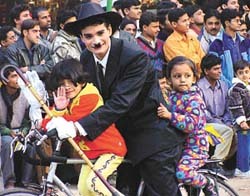 A new feature has been added to the scene at the road intersections of Delhi which offers the residents and visitors an idea of what the place is like at any one moment of the day. Vendors are a common sight at the traffic crossings. “BJP will fully preserve the interest of business community. Full protection and the dignity will be accorded to them”, said UP Chief Minister Rajnath Singh, while addressing the Vaish Awareness conference (Maha Samallan) in the Ramlila ground here today. Accusing the Delhi Development Authority of committing irregularities in the construction and sale of flats, the Bharatiya Janata Party’s Karol Bagh District General Secretary Ashok Gupta has sought a high-level inquiry into the “inflated” prices quoted by DDA for the sale of five-storeyed flats in Sector 4 of Rohini. The Haryana unit of Bharatiya Kisan Union has decided to revive the agitation against the state government. A decision to this effect was taken at an emergency meeting of the union held at Kandela in Jind today. Normal life in the city and the nearby regions was thrown out of gear today on account of thick fog and poor visibility. Both the rail and road traffic remained disrupted for the fourth consecutive day. HERE is good news for milk lovers and for those who aren’t. Mother Dairy has launched chocolate-flavoured milk, which means a treat for all, especially kids. 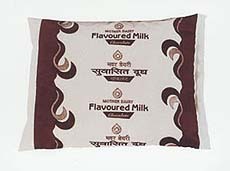 The milk comes in attractive pouches of 300 ml and is priced at an equally attractive Rs 10 per pouch. The chocolate flavour is the latest addition to the existing range comprising of Kesar Elaichi, Milk Masala and Vanilla. A special assembly was organised by Birla Vidya Niketan last week. It began with a poem composed and sung by Mrs Sonal Sachdev, a teacher of English in the school. The school choir then coaxed the whole school to join them in singing carols. RECENT attacks on the Indian Parliament have exposed a hard reality. When top leaders faced a threat to their lives as a group they saw the sovereignty of the nation in danger. Everyone lined up in unanimity to back the government in fighting an aar-par ka war. Is Punjabi culture confined to Bhangra and agriculture? Of course, not. But, very little is known about other aspects of Punjab’s rich cultural heritage, handicrafts and cusines. M. C. Merrykom of Manipur, the first woman boxer of India to win a medal in the World Championship, reasserted her class when she effortlessly outpointed Mamata Panda of Madhya Pradesh 24-15 in the light fly weight final of the second Women’s Senior National Boxing Championship at Indira Gandhi Indoor Stadium in the Capital today. Former champions Indian Air Force, New Delhi, and Garhwal Heroes played a goalless draw to share points in a B Division match of the Delhi Soccer Association (DSA)-SAIL Senior Division League Championship at Ambedkar Stadium in the Capital today. Deadly bowling of 3 for 23 by Rajasthan Ranji Trophy medium-pacer Parmod Yadav, 3 for 19 by off-spinner Ajit Chandela and an unbeaten knock of 48 by Paras Parjapat helped hosts and defending champions Friends Club beat Indian Air Force by six wickets to enter the semi-finals of the second Friends Cricket Tournament at Dharuhera in Rewari district today. Delhi did remarkably well by winning the overall team championship in the 47th National School Games 2001, organised by the Sports Branch of the Directorate of Education, Delhi Government, which concluded at Chhatrasal Stadium in the Capital today.